Wisconsin Badger coaches and players say they did it last year and they can do it again. Dropping the season opener against Northwestern didn’t stop Wisconsin from winning the 2014 Big Ten West Division title. They’re hoping Saturday’s 10-6 loss to Iowa will be followed by a similar winning streak. A crowd of nearly 81-thousand at Camp Randall Stadium left disappointed, even though the Badger defense kept the team in the game. Iowa managed only 221 total yards of offense, fewer than 70 in the second half. Iowa turned two Wisconsin turnovers into ten-points in the first half and beat the Badgers in Madison for the first time since 2007. A fumble with the Badgers on the Hawkeye one-yard line was the most critical offensive failure. Unlike last year, U-W doesn’t have a super-star tailback like Melvin Gordon to help lead the comeback from the troubling start. The Badgers (3-2) play at Nebraska (2-3) this coming Saturday. The Cornhuskers fell to Illinois 14-13 yesterday. The San Diego Chargers wanted to make sure they picked up a weapon in the NFL Draft, so they traded up two spots to secure former Wisconsin Badgers running back Melvin Gordon with the 15th pick overall. Gordon, who finished as a Heisman Award finalist and the Big Ten’s Offensive Player of the Year, becomes the fourth consecutive Wisconsin back to be drafted and the first since 2001. For the UW program, Gordon’s selection is the 29th overall in the first round of the NFL Draft, and extends a consecutive years streak of having a player drafted to 37. 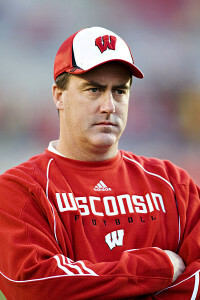 Gordon helped Wisconsin to a Big Ten West Division title and an Outback Bowl victory in his final season. In high school, he played alongside Michigan State cornerback Trae Waynes at Kenosha Bradford, winning a WIAA Division 1 state title in 2011. Waynes was taken four spots ahead of Gordon by the Minnesota Vikings. The Wisconsin Badgers put their 59-0 Big Ten title game loss to the Ohio State Buckeyes behind them. They knocked off the Auburn Tigers 34-31 in overtime in the Outback Bowl. The Badgers captured their first bowl game victory since 2009 and Barry Alvarez returned to the sidelines to earn his 9th (9-4) bowl victory. Melvin Gordon ran for an Outback Bowl-record 251 yards and three touchdowns and freshman kicker Rafael Gaglianone kicked a 25-yard field goal in overtime to give the 18th-ranked Badgers the victory. Gordon ran for touchdowns of 25, 53 and 6 yards and finished with 2,587 rushing yards on the season, 41 shy of Barry Sanders’ single-season FBS rushing record. Gordon was named the Outback Bowl MVP. 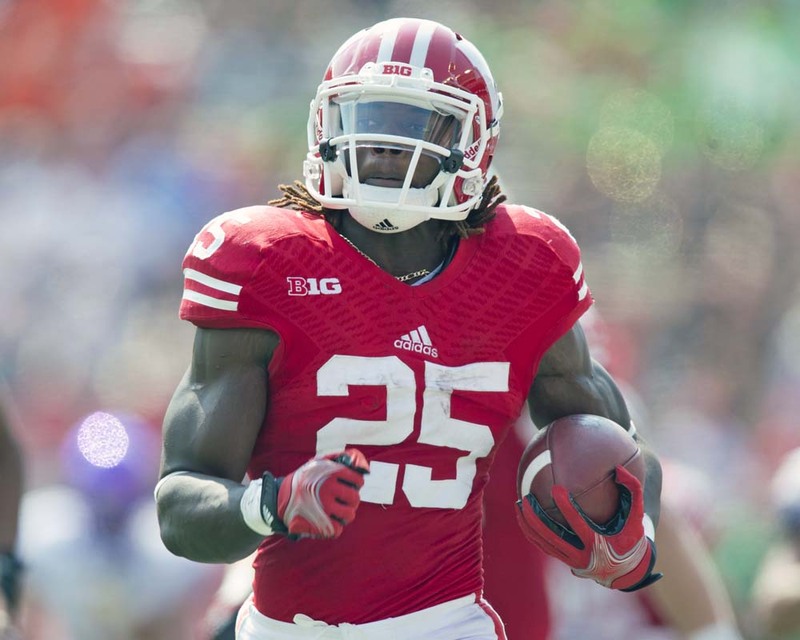 Wisconsin running back Melvin Gordon was named to the A.P. All-American team today. Gordon is one of fourteen Big Ten players to make the three teams. Gordon won the Doak Walker award as the nation’s top running back and finished runner-up in the Heisman Trophy balloting, behind Oregon quarterback Marcus Mariota. Three other Big Ten Conference players made the first team. On offense, Gordon is joined by RB Tevin Coleman of Indiana and OT Brandon Sherff of Iowa. On defense, Ohio State’s Joey Bosa was named to the AP first team. Oregon quarterback Marcus Mariota captured the Heisman Trophy on Saturday night, making five straight years that a quarterback has won the award. Mariota finished with 788 first place votes and 2,534 points. 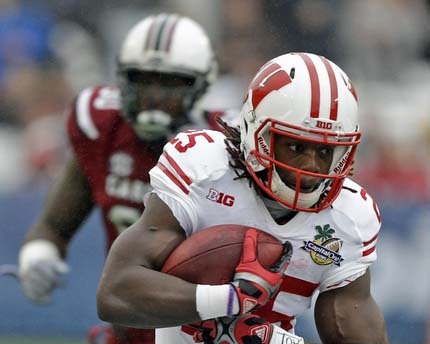 Wisconsin running back Melvin Gordon finished a distant second with 37 first place votes and 1,250 points. Alabama wide receiver Amari Cooper was third. Mariota has completed 68.3% of his passes for 3,783 yards, throwing for 38 touchdowns with only two interceptions. He also rushed for 669 yards and 14 touchdowns. Gordon leads the nation in rushing yards (2,336), rushing yards per game (179.7) and rushing TDs (26). Gordon was UW’s fourth Heisman finalist. Wisconsin Badger running back Melvin Gordon has been named one of three Heisman Trophy finalists, joining Oregon quarterback Marcus Mariota and Alabama wide receiver Amari Cooper. The Heisman winner will be announced Saturday night in New York City. Gordon is the fourth finalist in UW history, joining previous Heisman winners Alan Ameche (1954) and Ron Dayne (1999), as well as Monte Ball who finished fourth in the 2011 Heisman voting. Mariota is considered the favorite to win the award, completing 68% of his passes for 3,783 yards, with 38 touchdowns and two interceptions. Mariota is No. 1 nationally in passing efficiency, second in passing TDs and fifth in passing yards. Mariota has also rushed for 669 yards and 14 touchdowns. Gordon leads the nation in rushing yards (2,336), rushing yards per game (179.7) and rushing TDs (26). Gordon is also a finalist for the Doak Walker award, which will be handed out in Orlando on Thursday. Cooper leads the nation in receptions (115) and receiving yards (1,656), is second in receiving yards per game (127.4) and is tied for second in receiving touchdowns (14). 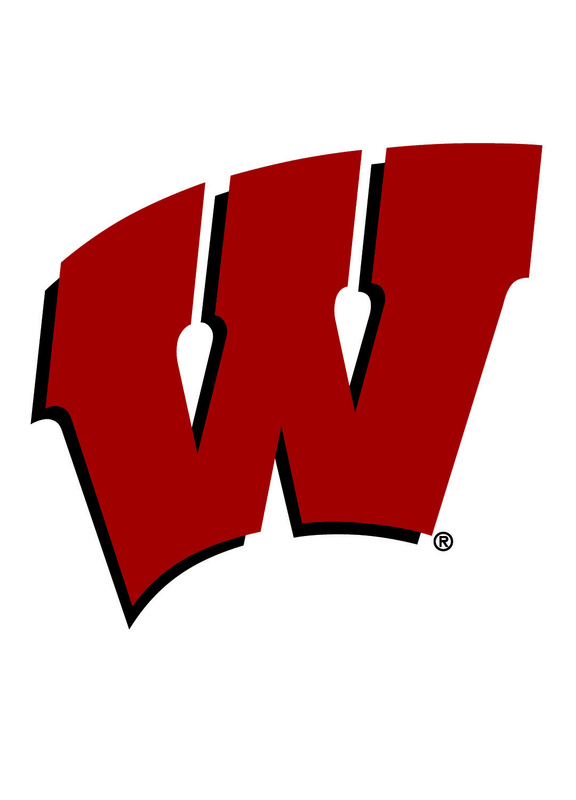 The 11th-ranked Wisconsin Badgers won the first two Big Ten Conference title games in 2011 over Michigan Sate and 2012 over Nebraska. The Badgers missed out in 2013 and look to bounce back and win the big game again this season. The Badgers (10-2) face the sixth-ranked Ohio State Buckeyes (11-1) in the championship game tonight at Lucan Oil Stadium. Ohio State has won 10 straight games since suffering a 14-point loss to Virginia Tech on Sept. 6. That loss came the week after the Buckeyes lost their starting quarterback Braxton Miller and replaced him with Big Ten Freshman of the Year J.T. Barrett. Barrett figured it out quickly after that defeat and went on to throw for over 28-hundred yards, rushing for nearly 1-thousand yards and accounting for a Big Ten single season record 45 touchdowns before suffering a broken ankle last week. One day after earning consensus first-team All-Big Ten honors and being named the league’s Ameche-Dayne Running Back of the Year, Wisconsin’s Melvin Gordon was announced as the 2014 Big Ten Offensive Player of the Year. It is the third time in the last six years that a Badger running back has earned conference offensive player of the year honors. The previous two were John Clay (2009) and Montee Ball (2011). Gordon is the 10th UW player to earn Big Ten Player of the Year honors. Gordon leads the country in rushing. His total of 2,260 rushing yards is a Big Ten record and fourth-best in FBS history. He trails only Barry Sanders of Oklahoma State (2,628 in 1998), Kevin Smith of UCF (2,567 in 2007) and Marcus Allen of USC (2,342 in 1981). Gordon’s average of 8.00 yards per carry is on pace to break the NCAA single-season record. Gordon also leads the country with 29 touchdowns this season, the second-best total in Big Ten history. With one more score, he would become just the third player in FBS history with at least 2,000 rushing yards and 30 TD’s, joining Sanders and Smith. With the Badgers entering the final stretch of the regular season knowing they needed to win out to earn a spot in the Big Ten Championship Game, Gordon was at his best. He rushed for 1,092 yards in November, more than all but 17 of the other 124 FBS teams. Gordon and the 11th ranked Badgers take on No. 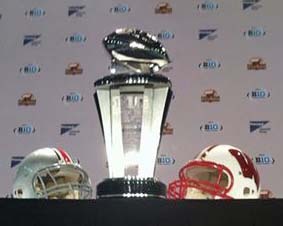 6 Ohio State on Saturday in the Big Ten Football Championship Game at Lucas Oil Stadium in Indianapolis.